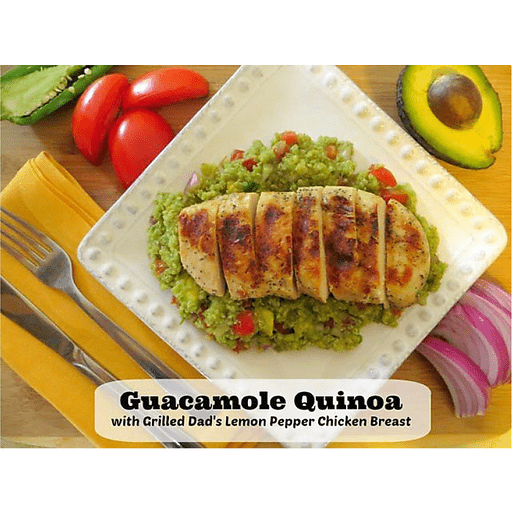 Whether your fresh produce is coming from your backyard or your local Festival Foods, we have a stellar recipe to help you enjoy some of this summer’s bounty: Guacamole Quinoa! 1. Rinse quinoa under cool running water using a fine mesh strainer. Add to a saucepan over medium-high heat. Stir in 1 ¾ cup chicken broth and bring to a boil. Reduce heat to simmer and cover for 10-15 minutes until quinoa is cooked. 1. Meanwhile, wash and chop tomatoes, jalapeño, onion and avocado. Add to a medium-sized bowl. To the vegetable mixture, add lime juice, salt, cumin, and garlic. Stir to combine. 1. Add cooked quinoa, stirring until well combined. Serve with grilled Dad's Lemon Pepper Chicken Breasts. Calories 410, Total Fat 15g (Saturated 2g, Trans 0g), Cholesterol 55mg, Sodium 710mg, Total Carbohydrate 37g (Dietary Fiber 9g, Sugars 5g), Protein 31g, Vitamin A 8%, Vitamin C 80%, Calcium 8%, Iron 20% *Nutritional values are an approximation. Actual nutritional values may vary due to preparation techniques, variations related to suppliers, regional and seasonal differences, or rounding.